Furniture buying can be a stressful, expensive process. Unless you don’t want to be stuck with pieces of furniture that don’t work for you in a room that you don’t feel happy in, steer clear of common blunders that will cost you money, time and stress. It doesn’t have to be difficult: follow our guide and you are much more likely to end up with great furniture that will make your life more comfortable and your home more beautiful – just remember to avoid these mistakes. Measure, measure, then measure once again. Especially when buying bigger pieces, getting the measurements right is really important. And we don’t just mean making sure that your sofa fits in its designated space on the floor. It might fit in the room, but will it fit through the door? What about the main house door, or that narrow part of the hallway, or the right-angle corner on the way? If you live in a flat, or are buying furniture for rooms above the ground floor, make sure you can get it upstairs: the staircases, especially in terraced houses or converted flats, can be a real bottleneck. And in a purpose-built high-rise block, a lift might not accommodate your new purchase – will you be able to lug it eight floors up? If in doubt, check all measurements, not just the longest one, and remember to allow some space for people who are carrying the piece. Sometimes, flat-pack furniture or a piece that can be taken apart and then re-assembled, is a better solution. While on the subject of measurements: consider not just getting the piece in, but how much space you need around it. It’s not the best practice to push sofas and armchairs against the walls, and you don’t want people to have to squeeze between too-tightly packed pieces of furniture. 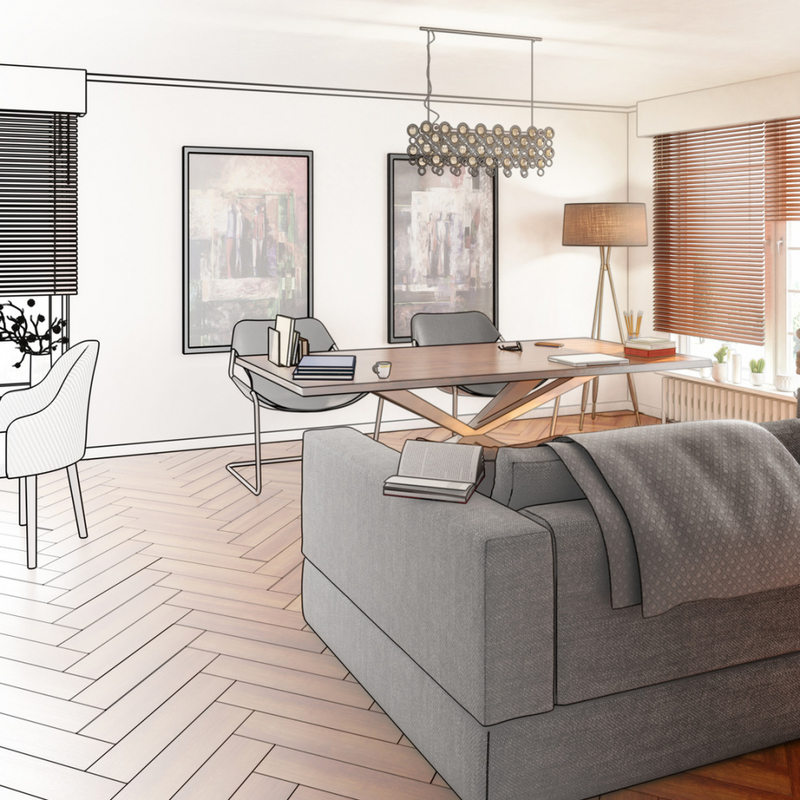 Ideally, you want to have about 18 inches (45 cm) between the coffee table and the sofa, 32-36 inches (80-90 cm) between pieces for ease of passage, and 48 inches (120 cm) for chairs around the dining tables, so they can be easily accessed and moved. Size is not just about practicality: a large item that looks good in a large showroom might dwarf your more modest living room and everything in it. If buying a large and expensive item, mark its footprint on the floor of the room with masking tape or full-scale paper cutouts, so you get a better idea of how it will fit in your space. Whilst too big can be overwhelming, too many small pieces can clutter up the space and make it look fussy and too busy. Too small a rug will actually make the room look smaller, while a single small picture on a large expanse of a wall will appear lost and lonely. Carefully consider how your room will work as a whole, and try to keep things in proportion, while varying the scale a bit to avoid monotony – all items at the same height won’t look good either. Design magazines, Pinterest and catalogues are great for inspiration, but don’t let yourself be completely swayed by somebody else’s arrangements and design schemes. Many items that look great in theory might prove disastrous in practice. A glass coffee table might look sleek and modern, but if you are planning to grow your family, the hard edges will create a hazard, while the surface will show up every single touch of sticky little fingers. Dainty little desk might become a nuisance if you need space to spread a lot of paperwork. Deep and squishy three-piece suite might need an addition of a firmer, higher chair if you get frequent visits from a relative with arthritis, and a low futon bed, great for teenagers, won’t work so well in a guest room used by visitors of more advanced age. The same applies to current fads: novelty items, bold designs and unconventional styles can look amazing at first, but imagine having to look at them day after day after day. Will you be still happy with the piece five years down the line? If you are not sure, it might be better to invest in a more timeless item. Have you fallen in love at first sight with an amazing piece of furniture you have just seen? Do you simply have to have it, now? Stop. Give yourself some time to think and seriously consider if it’s going to fit into your existing room, its style, its mood, as well as your own lifestyle (see point 3 above). Spontaneous purchases can turn into costly mistakes. Sleep on the idea, check the measurements, colours, materials -- and most importantly, imagine the piece in situ. Still in love? Then go ahead and buy it. There is also another side to impulse buying: after hours and hours spent searching, you just give up and pick something that “will do”. Don’t. Although perfection is not possible, settling on a barely-good-enough item is a mistake with which you might have to live for years. Be realistic about the wear and tear the furniture will be subject to, and about your own willingness to clean, pay for professional cleaning, and to keep shedding pets or chocolate-covered toddlers strictly away from your prized ivory chenille sofa. Then buy accordingly. We have all been there: the empty space that needs filling, or you are really fed up with your old stuff and want to replace everything NOW. It’s tempting to buy everything at once, and have the place furnished to perfection in one fell swoop. But it’s also a mistake, and might lead to overspending, creating a character-less space that neither works for your lifestyle nor reflects your personality. Buying furniture is a process, and the best interiors grow somewhat organically over time. This doesn’t mean random impulse purchases: planning and developing a theme with a coherent mood is important to avoid clutter and unpleasantly dissonant effects. Start with a big piece: a sofa, a dining table, a bed; design a feature wall or choose a fire surround and a mantelpiece. Every coherent interior needs focus. Once you have that, build around it by picking smaller pieces, accessorising and adapting. This way, you will end up with a room that looks good, feels right and works for you and your family. The desire to have a room furnished all-at-once can lead to another mistake: buying a complete matching set, sometimes with matching accessories. These can look great in a showroom or a catalogue, but in a real-life setting create a soulless impression of sameness, or look timid and boring. Coordinate, don’t match. The bed, bedside tables and chest of drawers all in the same style? The result will be flat and lifeless. Matching sets can offer great deals, financially, so it might be tempting to take advantage. And you don’t need to actually give up on the savings – just move the furniture around and split the sets between different rooms. It’s much easier – and likely to be cheaper – to find paint that coordinates well with your chosen furniture (for example, a sofa in a particular shade of blue) than to find suitable furniture that will match already painted walls. Start with your big pieces, then choose paint colours and accessories. Regardless of how great the piece of furniture looks, remember that you will have to live with it (and often, on it) for years to come. A sofa, chairs, or a table are not like pair of uncomfortable 4 inch heels you can suffer on special occasions – so comfort must come first. Although keeping within the budget is very much advised (and if you follow the advice in point 6 above, it shouldn’t be that difficult), a low price does not necessarily mean great value for money. Super-cheap furniture is often poorly made of low quality materials, and what you save now, you are likely to have to spend later on repairs or premature replacements. Not everything needs to have heirloom potential, but it’s worth searching for the best quality available within your budget. Solid wood frames, fabrics that are less likely to stain or fade in the light, and decent quality runners and hinges are all worth looking for.